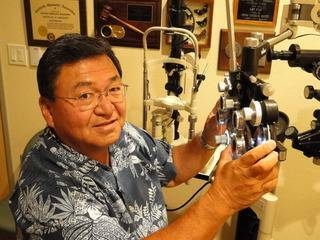 Dr. Gary Mukai has been practicing optometry in Fresno since 1974. He was originally a partner of Dr. George Miyake from 1974 to 1992. Dr. Miyake had a busy, established practice that was started in 1949. Their practice was located in downtown Fresno until 1985. The practice then moved to East Shaw Avenue just east of Fashion Faire Shopping Center. In 1990 the practice took on the identity of East Shaw Optometric Group and absorbed the practices of Dr. Gilbert Stocks, Dr. Dewey Jan, and Dr. Robert Hlywa. Dr. Jan and Dr. Hlywa continued to see patients at East Shaw Optometric Group until their retirements. In 1996, Dr. Mukai and Dr. Rick Ideta merged their two independent practices and became partners and continued to practice under the name of East Shaw Optometric Group. This means that in 2017, this optometric practice has been in continuous service for the past 68 years, the longest- operating optometric practice in Fresno. In March, 2010, the partnership of Dr. Mukai and Dr. Ideta moved to its present location at 7215 N. First St., Suite 101, and changed the name of the practice to Aloha Family Optometric Group. The practice specializes in general optometry, contact lenses, and vision training. Dr. Mukai was born in Fresno and attended schools locally in Fowler and Selma. He is a graduate of the University of California, Berkeley, and the Southern California College of Optometry. He is the author of “Tear Break-up Time As It Relates To The Shirmer Tear Test” published in the American Optometric Association Journal. He is a member of the American Optometric Association (AOA), the California Optometric Association(COA), and the Central California Optometric Society (CCOS). He has been awarded the CCOS “Optometrist-of-the-Year” in 1980, and the COA “Keyperson-of-the-Year” in 1988. He has served as president of the CCOS, member of the COA Nominating Committee, board member of the COA Political Action Committee, board member of the Primary Eyecare Network, president of the Quality Eyecare Associates and president and life member of the Southern California College of Optometry Alumni Association. Dr. Mukai has been involved in various community activities. He is a member of the East Fresno Rotary Club since 1975 and served as president in 1982-83 and 2008-09. He is also past-board member and past-president of the Fresno Zoo Society, past-board member of the Dance Theater of Fresno, past-board member of the Friendship Center for the Blind, past-board member of the Executive Association of Fresno, past-president of the Clovis Community Church, past-board member, past president, and Sunday school teacher of the Fowler Buddhist Church, current-president of the Central California District Council of the Buddhist Churches of America, Vice-President of the Buddhist Churches of America, commissioner and past board chairman of the City of Fowler Planning Commission, past-president and coach of the Central California Japanese-American Basketball Association, past-president of the Sierra Nikkei Golf Club, past-president of the Northern California Nisei Golf Association, past-president of the Fowler Buddhist Church Golf Club, and member of the Kings River Golf and Country Club. Dr, Mukai has been a 20-year resident of Fowler. He has been married to wife, Karen for 42 years and has two adult sons. Clinton is married to Bethany and have 2 year old twins, Grayson and Zoe. Clinton is an architect in Fresno. Son Mason is married to Lorraine and lives in Santa Ana, CA and is a marketing specialist. As a Doctor of Optometry, Dr. Mukai’s commitment to his patients is ongoing professional education. As technology and the world around us changes, he is dedicated to keeping up-to-date with the latest innovations and equipment in the eye care field to provide the best care possible for your eyes. Over the years of practice in Fresno, Dr. Mukai has developed relationships with the best sub-specialists in the area, so that when it becomes necessary for his patient to be referred out for secondary or tertiary care, he is confident that he would be able to refer them to the best possible care in the field.